Hedgeable stands out from the crowded field of robo-advisors by positioning itself as having a highly tailored investing strategy compared to its competitors. This means if you’d like a portfolio that has more than 200 options for customization, this robo-advisor is for you. However, personalization comes at a cost. Hedgeable's fees are some of the highest across all robo-advisors. While you’ll pay higher fees, Hedgeable argues that its theory is more complex and useful than the standard robo-investing theory of modern portfolio theory. Instead, it defines itself by including investing techniques such as downside-risk protections and core-satellite investing. Hedgeable offers more account types to choose from than many of its competitors. This might appeal to you if keeping all your accounts with one company is your preference. Pricing: How Much Does Hedgeable Cost? Hedgeable’s pricing strategy benefits those with deep pockets. If you’re on the lower tier of available funds to invest, you’ll be charged a higher fee. Fees start at 0.75% for $1 to $49,999 account balances. After that initial amount, your fees will go down in 0.5% increments depending on how much is in your account. Once you reach $1 million or more, your fee is 0.30%, which is the lowest it can be. The fee is considered an all-inclusive yearly fee. It's a “wrapped platform fee,” which means it includes almost everything, such as the investment advisory fee, the custodial fee, trading costs, administrative support and access to the site itself. Though it’s considered a yearly fee, the charge is deducted from your account each month. One thing to keep in mind is that you can still be charged fees for bank wires, check writing, and certain transfers such as with Hedgeable’s bitcoin partner, Coinbase. This is typical for many online investing companies. In addition to those costs, expense ratios charged by third-party ETFs are not included in the wrap fee. If you want to learn more, you can find detailed fee disclosures on Hedgeable’s site under the “Pricing” heading. Unlike most robo-advisors, Hedgeable doesn’t follow modern portfolio theory, which is based on return-to-risk based on estimates of each asset class. Hedgeable reasons that the theory isn’t dynamic enough to match the actual market environment. Instead, the company constructs portfolios based on simulations and sensitivity analysis and reviews all models constantly. The company prides itself on its large asset class which includes international and domestic equities, currencies, commodities, real estate and 11 other classes. Each account you open can have a different investment strategy based off of the answers you provide in the sign-up questionnaire. Some of your unique options include bitcoin, venture capital, and socially responsible investing. Impact investing allows you invest in causes such as alternative energy, female leadership or LGBTQ equality. Your portfolio will be created based off of your goals, diversification and growth potential (which is related to how much risk you’re willing to accept). A person with an account for conservative growth will have a different mixture of securities than another person seeking aggressive growth. 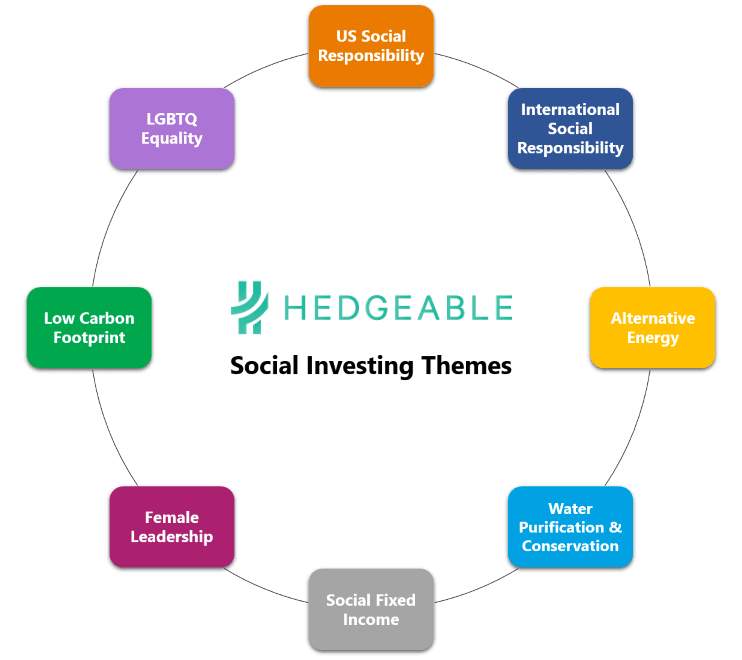 Hedgeable offers a wide variety of investment account options: 25, in total. If you’re a business owner you can offer solo 401(k)s, SIMPLE IRAs and SEP-IRAs. There are corporate accounts of multiple types, including LLC, sole proprietorship and investment club. If you’re hoping to establish a trust, you have six options to choose from. Individual retirement accounts are offered as well including rollover IRAs if you want to switch from another company to Hedgeable. Individual or joint taxable investment accounts are also available. With so many offerings, it may be easier to know what Hedgeable doesn’t offer, which is 529 college savings plans, individually directed IRAs and custodial IRAs. However, as the company grows and adds more products, this may change in the future. Hedgeable offers a suite of features for each account. Similar to most online investment companies, you can transfer funds electronically and schedule auto deposits to your accounts. Each account comes with a customized ETF/stock portfolio and automated management. You’ll get what Hedgeable calls “fanatical seven-day support,” so that you’re never in the dark. Downside risk protection is included for every single account, which is the company’s proprietary technology to minimize large losses without using risky techniques. Every taxable account has tax-loss harvesting, regardless of balance size. Smaller accounts have access to fractional share buying as well. In addition, you’ll have what’s called “go-to cash ability,” which is the ability to have 100% cash or equivalent in your account during high-risk periods to help prevent loss. The New York-based startup also offers unique investment opportunities such as bitcoins, venture capital and social responsibility. These are optional options for customers interested in those types of investments. Along with unique investments, the company has a rewards program called Alpha Club. It doesn’t cost anything and you’re automatically enrolled when you open an account. You can earn points by sharing on social media, setting up auto deposit, funding a first account, referring friends and more. Redeem points for events, tech products, charitable donations, lifestyle experiences and more. The only features that are added to your account as you increase your balance are fee breaks and increased hedging. Once your account is $100,000 or above, your portfolio will hold more asset classes and securities to further diversify your account. There is an iPhone app, but you don’t need to download it to access Hedgeable. The site is optimized for mobile use. However, while you can login or launch the iPhone app on the go, it’s only for staying updated on account status and for receiving push notifications. You’ll have limited functionality when accessing the site on your phone. You’ll need the full site to add or withdraw funds, change your investment profile, view analytics or open support tickets. Anyone who isn’t satisfied with the generic robo-advisor mix of ETFs and other securities may find a better fit with Hedgeable. While the company has many millennial-focused features, such as a mobile app, rewards program and $1 minimum balance requirement, it’s also positioned as a strategic choice for those with more money. You’re incentivized to have a high account balance with cheaper management fees the higher the balance. On the other hand, with an account minimum of only $1, the company strives to be inclusive. Hedgeable also includes an incredible amount of information for anyone who wants to get into the numbers deeper. There are white papers and detailed reports that outline exactly how portfolios are build and other key details. Some online investment companies keep information to an absolute minimum, but Hedgeable goes in a different direction. You also have a staggering array of options for accounts. Not only does the company offer all of the standard taxable and retirement accounts, but it also has business options, trusts and more. If you have many investment account needs and would rather have automated investing instead of paying broker fees, this may be one of your best choices. Once you decide to open an account, you can choose from more than 20 accounts. You can open one or multiple, or even transfer all of your other accounts over to Hedgeable. The flat yearly fee is based on the total amount of your assets, not the number of accounts you have. You’ll need to be a U.S. citizen or resident alien, and you’ll need a valid Social Security number. You must be 18 years or older, and if you’re opening a corporate account, you’ll need a U.S. Tax ID or EIN. The minimum investment is only $1, which means you can get started right away. You’ll fill out a 10-step questionnaire to build your portfolio’s asset allocation. There’s a live chat feature if you have any questions while you’re navigating the onboarding process. If you’re opening a taxable or joint account, you can fund it with an electronic transfer, check or Fed Wire. For IRA transfers or rollovers, you’ll need to liquidate the securities held in the account and follow the steps listed on Hedgeable’s site. Once the transfer is complete, you’ll receive an email. After your account (or accounts) are open and funded, you can monitor your investments online or via the mobile interface. You’ll have access to analytics and other insights regarding your money. And you’re not locked into a certain portfolio. If you want to change things up, you can login and modify your investment goals at any time. It will take roughly one business day to get your account aligned with your new goals. The most obvious downside to using Hedgeable is its relatively high fee. Compared to competitors like WiseBanyan, which offers a free account option, you’ll start paying an advisory fee with a $1 deposit with Hedgeable. Other companies offer 0.25% or 0.30% advisory fees, while Hedgeable starts at 0.75%. However, the company argues that its fees are due to the unique investments and wide range of securities it offers. The company offers premium options to every account, such as tax-loss harvesting and live chat support, so you’ll have to determine for yourself if it’s worth the fee. It also stands to be seen whether the company makes good on its claim to minimizing losses by using a different investment strategy than most other robo-advisors. If it’s true and the company does better than its competitors, it may be worth the fee. Also of note is the lack of college savings plans. While the company offers a huge array of products, it’s missing 529 plans at the moment. If you’d like to open that type of account, you’ll have to look elsewhere. Competition: How Hedgeable Stacks Up? Hedgeable’s two most obvious competitors are Wealthfront and Betterment. With Wealthfront, you need $500 to get started, and the fee is a flat 0.25%. Betterment's fees range from 0.25% to 0.40%. And with Betterment, that highest tier pricing comes with unlimited access to certified financial planners, but requires a minimum investment of $100,000. 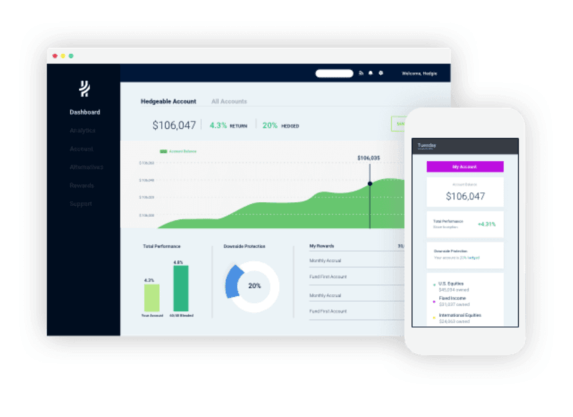 Betterment also offers free account management for accounts over $2 million. To get your fees down to 0.50% at Hedgeable, you’ll need an account balance of $250,000 to $499,999. However, fees aside, Hedgeable argues that the portfolio you get on its site is customizable in more than 200 ways, which is much higher than its competitors. The company argues that its investing platforms have more options and sophisticated assets rather than the limited options offered by competitors. Even with that, Hedgeable doesn’t offer direct indexing, which Wealthfront does to its customers with accounts over $100,000. If you’re just getting started with online investing, you may want to consider a free service instead, such as WiseBanyan or Schwab Intelligent Portfolios. Both sites offer services free of advisory fees, but you’ll need at least $5,000 to get started at Schwab. 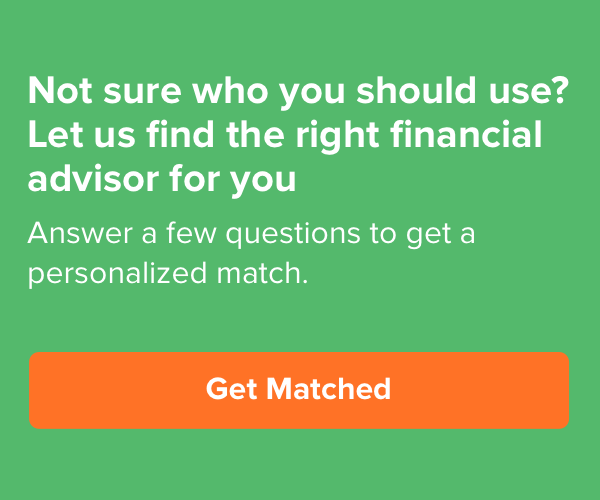 It is important to note that Hedgeable has a very large array of accounts, but it doesn’t offer 529 college plan accounts, which Wealthfront does. On the plus side for Hedgeable, the company offers fractional shares, which Betterment also does but which Wealthfront does not. Bottom Line: Should You Use Hedgeable? 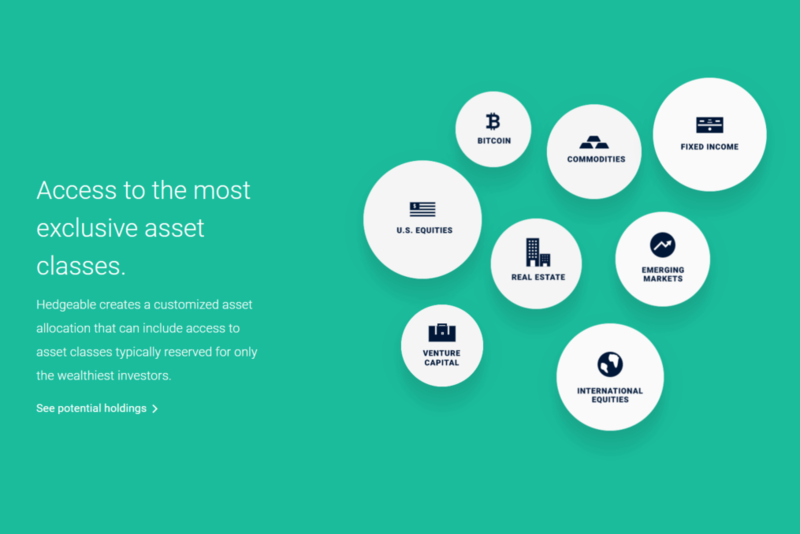 If you dig into Hedgeable’s unique investment strategy and asset allocations, you may find you like what this company’s doing better compared to competitors such as Betterment and Wealthfront. Wealthy investors may benefit the most from this company with the tiered pricing that favors large accounts. You will need at least $1 million to get your pricing down to 0.30%. That said, the company offers tax-loss harvesting, hedging and an array of attractive investment features. With all the publically available information this company displays on its site, you can get a good sense of what the company will do with your money. It comes down to what you’re looking to do with your investment accounts. If social investing or bitcoins or a unique investment approach is appealing to you, this may be a good robo-advisor choice for you.